"Create habits that will make for success in the most difficult situations" - Jay Wright. Jay Wright opens up one of his practices at Villanova University to show you how his program develops their offensive system. Learn how to improve even the smallest details in techniques for passing, footwork and shooting. 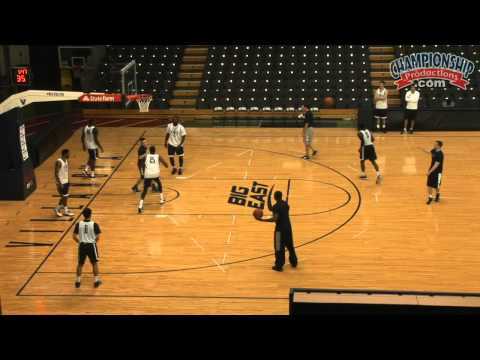 Watch as Coach Wright breaks down different scoring options in his offensive system into drills for players to master. See all of the pieces come together and learn how Coach Wright teaches players to recognize game situations as Villanova practices its offense in live scrimmages. From the outset, Coach Wright explains that the goal of the 2-hour practice is to continue to build an offensive awareness that will allow each player to execute any offensive move regardless of which foot is the pivot foot. Coach Wright stresses the importance of spacing, reading screens and a general understanding of the details of the various offensive sets that will be used. He wants players to understand the concepts of each set, which then enables them to react more efficiently when an opponent takes away specific options. Coach Wright uses skill development, 5-on-0 offense and 5-on-5 situations to translate drill work into game situations. This segment of practice centers on individual skill development. Guards and posts are split with the goal of improving footwork, taking shots that will be available within the offense and reading ball screen situations. Each drill utilizes a passing line as well as a shooting line, with shots present for each of the two players to get repetitions within the drill. In the footwork drill series, inside pivots, reverse pivots, drop steps, jab steps, rip-throughs, jump stops in the lane and "bully" drives are heavily emphasized as Coach Wright walks from rim-to-rim to correct any mistakes he sees. In the shooting series, players focus on footwork and reading the situation as they execute shots off of ball screens, down screens, curl cuts and flare screens. Within each exercise, players are taught both a go-to move and a counter, as Coach Wright informs the team of which situation they are to imagine occurring prior to each set of reps. The 5-on-0 segment involves incorporating the individual skills work into a 5-on-0 situation (dummy offense). On display are the Villanova aces, deuces, and flat offensive sets. Each involve ball-screen actions but from different locations on the court. As an example, flat involves a high ball-screen at the top of the 3-point line, with two spot up 3-point shooters spread on opposite wings below the free-throw line. The remaining offensive player is below the block near the short corner. The ball handler is instructed to penetrate into the lane where he will have his choice of options depending on which direction he went and which help defender is forced to leave their man. The segment of practice brings it all together; everything previously worked on is now incorporated into a 5-on-5 setting. A half-court shell offense is on display as aces, deuces and flat sets are incorporated against an active defense. Coach Wright then allows full-court scrimmaging action in a game to 15 where points are awarded for techniques that were emphasized during practice such as turnovers forced, offensive rebounds and all-around skills execution.